This has taken me a long time to post, but it was about time I continue the story of our San Francisco journey a few months back, which started with brewery visits. Another fantastic part about our visit....WINE COUNTRY! Possibly one of my favorite spots in the country. The never ending rows of grapevines, friendly people and unbelievable wines. I am lucky enough to have traveled out there several times, but this was Ryan's first trip and first real experience with wine tasting. I say real because he has been wine tasting before and knows the proper techniques and etiquette, however, there is something to be said about tasting wine in the Mecca of vinification (translation, wine making). 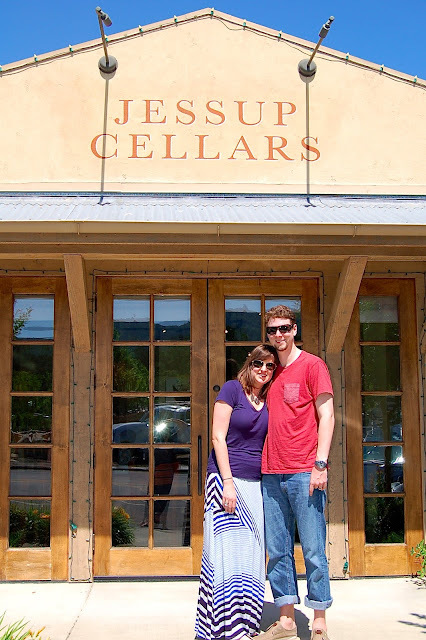 During our visit to San Fran with our besties (remember Jess and Corey), they took us to one of their favorite wineries, Jessup Cellars. A private little winery in the heart of Yountville (Napa Valley). We tasted about 7 wines and thoroughly enjoyed each one. Ryan and I left with only 2 bottles since we were flying home and limited on space. HOWEVER, Jess and Corey sent me a bottle of Petit Sirah for my birthday along with an amazing chocolate sauce. The birthday celebrations have come and gone. I just received, what I think will be my last birthday card or gift for the year, but what a great birthday it was!! I definitely felt the "getting older" blues this year for the first time, probably because I have one year left in my 20's. I know, I know, I have plenty of time left, but one can't help but think about it. I had several friends come into town for my birthday this year, including my crafty blogger friend Trendy Kendie. Kendal came down and actually ran in the 10K birthday race with me - we rocked it the entire way to Daft Punk's new album and had a blast (despite the horrible heat and humidity). 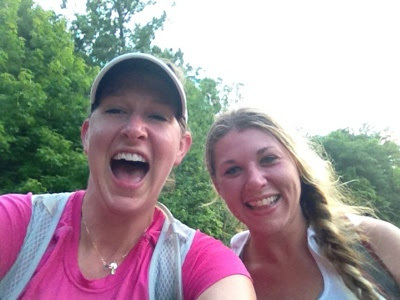 Kendal is a great friend from college that shares many of the same passions and hobbies as I do, including blogging! She rocks at homemade gifts, and proved herself yet again by making me vanilla perfume and homemade cloth napkins. Everytime she comes to visit me, she brings one of her amazing creations, which leaves my house smelling amazing! I wish she lived in Raleigh so we could share perfumes and recipes all the time! I also learn a lot from her about various aspects of the food industry. She's a smart girl, that Trendy Kendie!! I can't take credit for her DIY goodies though, so hop over to her blog today to check out how to make the perfume and placemats!! While she was here, I had to spoil her with some homemade goodies of my own from the kitchen. During her visit, I introduced Kendal to microgreens! I wish these were a staple in my kitchen, but unfortunately I can't always find them. They are mostly available at the Farmer's Market in the summer and sometimes at specialty food stores. Microgreens are one of my favorite types of produce to purchase because they can go with everything. First of all, microgreen is a term used for a whole plant harvested at a young seedling stage after a few leaves have begun to grow. They aren't to be confused with sprouts, which are grown in water and consumed whole, microgreens are grown in soil and cut at the root. These little greens are not only a fantastic garnish for dishes, but are full of rich antioxidants, amino acids, enzymes and other essential nutrients, not to mention taste amazing. Microgreens are commonly used as garnish in nicer restaurants, however, I like to incorporate them into my dishes. There are many different types of microgreens, which in turn means many different flavors! Basically any type of lettuce or herb, is at one point a microgreen. 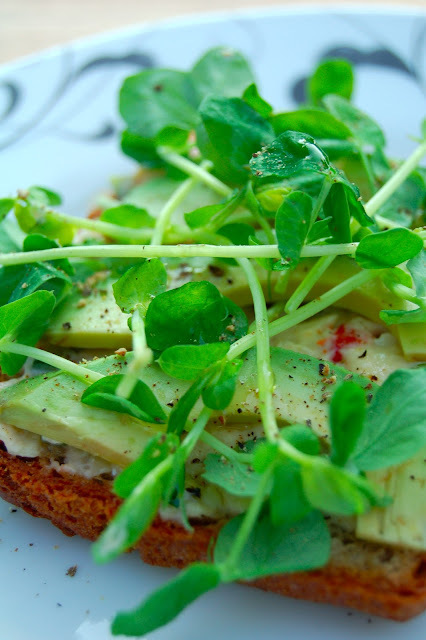 In these images I topped a piece of gluten free toast with my homemade pimento cheese, avocado, pepper, olive oil and microgreens. It was a perfect refreshing snack for the hot afternoon, especially when served with a cold beer! If I don't top toast with these little green gems, I incorporate them into salads, omelets, sandwiches/wraps, over my breakfast, in tacos, and the list goes on. This is a super easy side to make! If I can convince someone to add more vegetables to their diet, then I better make it easy to make. Often times, when I am short on time, I will rely on pre-washed and pre-trimmed vegetables ready to steam. You can often find a bag of microwave-ready veggies in the produce section of your grocery store. In order to dress it up a bit, just add some flavors, like my version of Green Beans Almondine. This is one of Ryan's favorites, but I tend to leave off all the butter and create a honey mustard dressing instead. The dressing can also be used for a salad dressing, so make extra! Don't be lame, eat your vegetables!! Prepare the green beans by either steaming in the microwave or blanching in boiling water for a few minutes, followed by an ice bath. Mix the yogurt, honey, both mustards and lemon juice in a small bowl and set aside. To serve, place the green beans on each plate or platter, drizzle with honey mustard and sprinkle almonds (and dried cranberries) over top. Serve immediately. We love the 4th of July around here! Fireworks, cookouts, and a vacation day...so many wonderful things about our Nation's birthday. 'Merica!! Since color is such an important aspect of cooking, I had an idea to play around with our beloved flag colors for today's post. I quickly realized that I don't have any blue dishes!! Then I quickly realized again that I have yet to highlight blueberries on the blog, which is crazy, because they are in season and delicious right now. When I think of blueberries, I usually think desserts, which I mostly can't have. So I decided to challenge myself and come up with an appetizer. I had several pints of blueberries, various types of cheese and two taste-testers in my house yesterday. I did what any normal food-obsessed person would do, experimented! Ryan and his brother Paul were enjoying one of the many sporting events on TV, while I pulled out every dairy product and cracker we had in our kitchen. Overall, I did about 15 different combinations, but the unanomous favorite were the roasted blueberries over melted Gouda in fillo shells with thyme and white pepper....say what?!?! Let's back track and talk about how we got there...I started with fresh blueberries and made little toothpicks with each type of cheese and a blueberry. The favorite there was with a Blue Stilton cheese. We called these Blue on Blue! The next step was filling fillo shells with different types of cheese and topping with a few blueberries. I melted these in the oven for a few minutes and topped with either a bit of honey or cracked pepper, depending on the cheese. We called these Sinking Blues! Like most of the fruit in my kitchen, I wondered about cooking the blueberries. They get so sweet and juicy in a pie or galette, why not with cheese! The result was amazing! I mixed the blueberries with a little bit of lemon juice and honey and roasted them in the oven for less than 10 minutes, just long enough for the blueberries to pop and create a nice juice in the pan. If you can find a goat milk Gouda cheese (Trader Joe's has one), this was the BEST with the roasted blueberries. We also found the plain water crackers to work best also. Triscuits are too thick and take over the flavors. We spiced it up a notch with white pepper and thyme leaves. All in all it was a delightful little blue appy to enjoy on a Sunday afternoon. Preheat the oven to 375F and mix all the ingredients in a medium bowl. Line a baking sheet with foil and spray with oil or brush with melted butter. Roast the blueberries for about 7-10 minutes, or until the blueberries start to pop. Remove and bring to room temperature. Serve with your favorite cheese and crackers!